A year ago on this weekend a reboot of the nineties hit show Power Rangers was released and embraced a more moody and grounded tone than that of its source material. 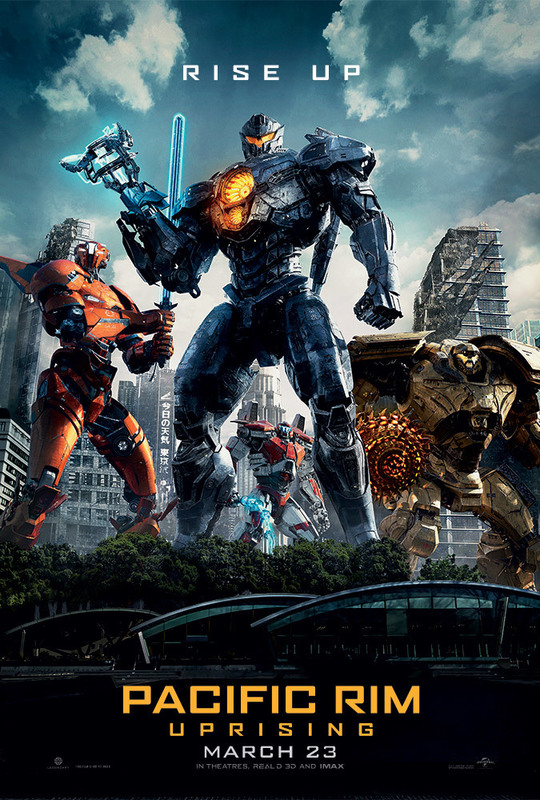 This year, with Pacific Rim: Uprising what we have is what that movie might have been had it decided to go another route and play up the more cartoonish aspects of that super hero series. This is to say that Uprising is so bombastically cheesy in its reliance on knowing exactly what it is and delivering on exactly what it promises that it's genuinely hard to fault the film for doing what it sells itself to be. Pacific Rim: Uprising is a five year-later sequel that no one in particular was necessarily looking for, but is here given the amount of dough that original ended up making in China ($411 million globally on a $190 million budget, $111 of which came from China-almost $10 million more than the film made domestically). Of course, with this kind of sophomore slump effect weighing on the decision of whether or not to even continue the would-be franchise this second installment has come to us not from "visionary" and now Oscar-winning director Guillermo del Toro nor does it star Charlie Hunnam or Idris Elba, but instead is co-written and directed by Netflix's Daredevil season one showrunner Steven DeKnight and enlists the fresh talent of Star Wars-breakout John Boyega as the son of Elba's fallen character from the first film. Uprising jumps a decade into the future and intends to reboot Pacific Rim the opposite way that Power Rangers movie did the original series last year. Meaning, while the first Pacific Rim was a little too self-serious given its story and a little more moody than might have been necessary, while more visually detailed to be sure, Uprising plays things a little more straight-forward and is exactly the kind of movie I would have loved when I was seven or eight years-old; it's big, it's colorful, and it has robots fighting robots and robots fighting monsters. That isn't to say this is a better film than its predecessor-I don't think I'd go that far as del Toro still enlisted a fun enough tone and built an entire world from which Uprising benefits-and Uprising maybe complicates things a little too much with its story whereas that initial film was so cut and dry in that aspect it was almost shocking, but the important thing is that Uprising is a fun if not ultimately forgettable slice of entertainment that plays to its B-movie strengths. Amara (Cailee Spaeny), Jake (John Boyega), and Nate (Scott Eastwood) prepare to cancel the apocalypse once more. Speaking to the unnecessary convolutedness of the story, Uprising at first hits the ground running introducing the audience to Boyega's Jake Pentecost as it's made clear the son of war hero and saver of the known world, Stacker Pentecost, is not exactly following in daddy's footsteps. Rather, Jake-who we are told was once a promising young Jaeger pilot himself-has turned to making a living off the stealing and selling of Jaeger parts on the black market. Ten years on and the need for Jaeger pilots is not as vital as they once were, but more the world has resigned to re-building large portions of its biggest cities while in other areas-not changing a thing. In the rubble of one of the remaining ruins Jake comes across a young, orphaned girl named Amara Namani (a charming Cailee Spaeny) who has also been scrapping together Jaeger parts on her own and has assembled a functioning albeit much smaller robot warrior than the military ones that once roamed the coastlines. When both Jake and Amara are arrested for stealing parts and going on the run in their own Jaeger the two are only rescued thanks to Jake's namesake and the fact his adoptive sister, Mako Mori (the returning Rinko Kikuchi), who is now the General Secretary for the "Pan-Pacific Defense Corps" gives Jake a choice between prison and returning to the PPDC as an instructor. Naturally, but begrudgingly, Jake accepts Mako's offer to return to the PPDC as Amara's innovative tendencies are rewarded by being recruited into the training program that is currently overseen by a former co-pilot of Jake's and his apparent nemesis in Nate Lambert (Scott Eastwood). Simple enough, right? The newly restored Jake, his protégé, and the pre-existing recruits along with Nate run into some new Kaiju threats and have to set aside their differences in order to protect the world once again. That would seemingly be the case, correct? Not so much. To this point, it's nice that Uprising doesn't necessarily go the simple route or the way most audiences likely anticipate it will, but at the same time where it does go isn't exactly convincing as it follows the trope of an evil corporation desperate for power that becomes so outlandish we have a Saturday morning cartoon that flirts with ideas of man playing God rather than just man fighting monsters. It's a mixed bag. Maybe the most egregious example of the movie going about something interesting in completely the wrong way is that of how it utilizes Charlie Day's character from the first film, Dr. Newt Geiszler, to accomplish as much. At the risk of spoiling too much let's just say that I was happy to see Day back in his role as his and Burn Gorman's Dr. Hermann Gottlieb provided some of the more interesting and enlightening aspects of the original especially in regards to how the Kaiju operated and the massive repercussions the world was facing because of their presence. Here though, neither Dr. Geiszler nor Dr. Gottlieb are able to contribute in these suggestive ways as they are more used to further the plot than comment on it. What is safe to say is that Day's character goes in some pretty strange directions. In the decade that has passed since the previous film, Dr. Geiszler has gone on to work for the Shao Corporation as run by Tian Jing's Liwen Shao who, along with Geiszler, has developed a Jaeger drone program and looks to push to replace Jaegers piloted by two-person teams. Our group of protagonists are naturally threatened by such a proposition, but it makes sense and I'm glad they brought this up as it was one of my personal big plot hole questions in the first film: if we have the technology to construct these giant robots, why can't we just control them remotely? Though Uprising doesn't necessarily explore this question directly i.e. it never fully justifies why the "neural handshake" is a stronger, more reliable way to pilot a Jaeger than it might be to do so from behind a keyboard what it does move towards is maybe a more layered approach, but a seemingly stupid one until we find out all of the layers that need to be pulled back in order to see the bigger picture in the clearest fashion. Point being, Uprising wants to have its cake and eat it too in regards to being a blatant example of a "big, dumb, fun" action movie that holds onto nothing more than its rogue-ish lead character and its bread and butter that is big robots fighting massive monsters from another dimension while simultaneously drowning the audience in so much plot and back and forth between what the viewer believes to be happening and what is actually happening that it isn't until the final climactic battle of the film that both the audience and the movie realize we haven't actually witnessed a Jaeger versus Kaiju fight. It's a double-edged sword, really, as it would have been too easy to believe the breach conveniently opened up at this time when our new protagonist finally decided to get his act together, but at the same time that's what people are paying to see and while Uprising eventually delivers on this promise one has to wonder if it could have taken a more carefully considered route to get to its inevitable destination. The "Pan Pacific Defense Corps" Jaeger's fly back into action in Pacific Rim: Uprising. Taking as much into consideration, Uprising mostly still coasts off the charm of being just that: a big, dumb, and most importantly-fun-action movie. The score from Lorne Balfe, taking over duties from original composer Ramin Djawadi, is cool in the sense that it's mostly a traditional orchestral score, but with flares unique enough to make this audience member take note. Sure, Balfe riffs on the main themes composed by Djawadi to maintain that connective tissue between the two films, but there is enough of a fresh take on that material present that one can feel the difference in tone and approach. This mostly deals in it being a lighter approach which applies to the more vibrant color scheme of Uprising. Whereas del Toro shot the majority of his robot on monster action in the dark and in the rain, DeKnight seems to have been intent on setting all of Uprising's major action beats at noon or when the sun is at its highest point in the sky as we see multiple Jaeger's bathed in the sunlight in this thing. It's kind of astonishing how great and sleek this thing looks overall though as I expected the budget to be dropped somewhat significantly (and it was, a cool $40 million), but there is a tactile nature to the Jaeger's that was present in the first film and that I expected to be washed out here thanks to the sun and the budget cuts, but is rather embellished because of this change of scenery. DeKnight and his production team certainly knew where to spend their money and by that I mean when three battered Kaiju are tethered together by little insect Kaiju into one massive Kaiju (yes, that happens) it looks fantastic and despite knowing how silly it is one can't help but be a little giddy due to the fact it's so easy to admit how much this movie is just going for it. There is something to love and admire about that kind of balls to the wall methodology and if Pacific Rim: Uprising deserves to be remembered for anything it is just that. And last but not least, let it just be said that Boyega is seemingly having the time of his life bouncing in between Star Wars films to B-movie bonanzas such as this while simultaneously leveraging his career with solid work as displayed in last summer's seemingly underappreciated Detroit. As our lead, Boyega displays his boyish charisma in spades and makes the sometimes laughably on-the-nose dialogue work by bringing his sense of humor to a character that, for the first time since what feels like Attack the Block, allows him to use his natural British accent. It also seems time we all admit Scott Eastwood isn't a good actor and has zero to no screen presence. I'd love to see the guy prove me wrong, but his work in picking up the pieces in these already established franchises makes him feel like little more than a bat boy. Still, as much as this could easily be written off as mindless monster fun there is a charm to Uprising in that you may forget about it soon after seeing it, but you won't mind re-watching it every now and then to be reminded of why you didn't mind it.